Today I overheard a friend being extremely critical of someone else. As he went on and on, critiquing this and remarking about that, my ears couldn't believe what they were hearing. As he criticized his "brother", his words began to paint a picture in my mind; a perfect picture of his own life. Why are we so keenly aware of the faults of others and yet blind when it comes to seeing the "real" us? Those with a low self-image have trouble seeing their God-given talents, while those with an ego often see traits, qualities and talents in themselves the rest of us have yet to see. Either way, the truth is distorted; the perception, askew. Either self-image is unhealthy and potentially destructive. Jesus came so we might see ourselves in the true light of who we are. Sinners who are saved by grace. If there is anything unbecoming or sinful in us, Jesus is more than ready to forgive us and to re-create us in His image. If there is anything praiseworthy in us, Jesus is the one to be praised. Either way, it all comes back to Jesus. Yes, let God be the Judge. Your job today is to be a witness. Amen -- may it always be about Jesus. This post makes me want to lay it all down at the feet of Jesus -- my areas of pride and my areas of insecurity. Isn't wonderful that we are saved by grace, God is so good. I stumbled upon your blog today by linking up and what a wonderful surprise. 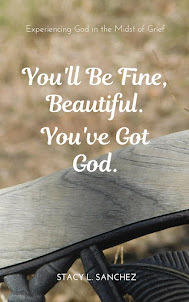 Keep on encouraging others with these beautiful posts!! ah, Jesus. sweet, sweet name. do we have any concept, truly, of how blessed we are? of the privilege it is to be called one of His own? it all comes back around to Him. oh, how i love Him. Hi Stacy - great post. I think there is a bit of a theme going here. Quite a few posts are picking up in judging others and looking at our faults first etc. Maybe God is trying to tell us something?